To tempt the truly discerning traveller, we are proud to announce the addition of our new luxury “Prestige Range” to our existing fleet. 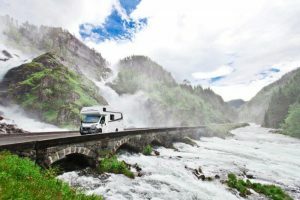 Our new luxury vehicles follow the very latest trends in motorhome design and have been carefully selected from the top-selling manufacturer in Germany. Needless to say, these gorgeous vehicles are a little more expensive to hire than our standard range but they offer a raft of sophisticated touches that make them truly worth it! 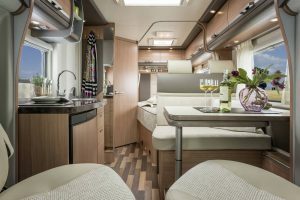 From luxury mattresses to soft-closing drawers, enhanced driving comfort to ultra-modern interior design, these beautifully finished vehicles simply boast the best of everything. After a long search for a more compact motorhome for couples or single travellers, within our new Prestige range, we have also found the perfect compact motorhome for two: The Euro-Explorer Compact Prestige (the photo above is of the sumptuous dining area). Don’t worry if your budget won’t stretch to the new Prestige fleet, our trusty standard fleet remains as young (a maximum of two seasons old) and beautifully turned out as ever. Check out our full range of vehicles for 2016 here.